Avenida, Mexican-Asian Kitchen, located in Minnetonka, Minnesota was quite good. We'll definitely return again soon. Last night, I dropped off grandson Miles at home at the end of his "date with grandma" which began at 8:00 am until almost 5:00 pm when I returned him to his home. The traffic was outrageous, taking more than 50 minutes to drive about 10 miles and slightly less on the return to the hotel. Making this round trip twice a day, three or more times a week results in plenty of drive time, at about three hours per day. Gosh, I'm not used to this. Then again, after not driving for two years in the South Pacific, I must admit I do get a kick out of the new Ford Explorer's digital equipment, especially being able to make a call or do a text through the vehicle's navigation system using voice commands only. Tom looked a little tired in this photo taken at dinner last night but he perked up after a good meal. Listening to my favorite radio station from years past, 107.1, has also been relatively entertaining. Of course, when the grandchildren are in the car buckled into the back seat, the radio is off allowing us to chat in typical kid speak. Talk about "entertaining!" Having each of my three grandchildren, one-on-one, over these past weeks has been the best possible way to further enhance our relationships. Quickly, we've found our way to a new level of closeness we never even had in years past, especially now that they're older. But, not surprisingly, in many ways they're the same little people they were when we lived here in 2012; each unique in personality and demeanor; each engaging in their own special way. Luckily, over these years, we've stayed in close enough touch, that they immediately felt comfortable being with us, whether it's just one of us or when we're together. The ambiance at Avenida is pleasant and well lit. Tom's interaction with his three grandsons is different, spending valuable time with them as a family as in the case of TJ's two sons Jayden and Nik and now with some alone time with Tammy's son, Vincent. Last Friday, Tom took Vincent to the family cemetery in Winsted, Minnesota after Vincent had expressed considerable interest in ancestry. Tom, the ancestry.com guru, was delighted when Vincent showed interest in this topic and Tom was all over it. Afterward, Vincent and I watched a good kid movie together, Rise of the Guardians. We both look forward to more interactions with all of the grandchildren and our adult children and their significant others during the remaining 24 nights in Minnesota. And, of course, we'll certainly spend more time with Tom's huge family. The combination of the Mexican and Asian decor was a bit odd but its trendy. What do we know? Also, we still have many upcoming events planned with friends. It doesn't appear we'll have time for multiple friends "get-togethers" but we're taking advantage of every available moment during this period. As for dining out at least six times per week, it's working out well. We've held up well with our budgetary goal of spending an average of no more than $30 per day for our meals especially when breakfast in the hotel is complimentary. The fact that we aren't drinking any alcohol, ordering appetizers and desserts, this is very doable even with generous tips we're leaving for great service. We continue to try new mid-range restaurants, finding it easy for me when I mostly order Cobb or chopped salads with lettuce, chicken, boiled eggs, bacon, cheese, guacamole with a side of full-fat sour cream as the dressing. My chopped salad with a side of Mexican season shredded beef. Last night, we decided to try a Mexican-Asian restaurant, Avenida, which although about $10 higher than we usually pay, we found to be very good. It was odd to us to see this two-in-one style of menu...part traditional "gourmet-type" Mexican food and options for slightly elevated Asian dishes. This must be something new in the US. Tom ate two bowls of complimentary tortilla chips (without the salsa) and ordered an Asian Sweet and Sour Chicken dish for his entree while I took a few tastes of the salsa without the chips. Again, as shown in today's photos, I ordered a chopped salad with a side of shredded Mexican seasoned beef. It was the best such salad I'd had since we arrived and I hope we'll return for more in these next weeks. Tom's entree, Sweet and Sour Chicken. He picked out all the bell peppers, leaving him with a third less on his plate. It's all good; the loving interactions with family and friends; the hotel, Country Inn & Suites; the meals at the hotel and in restaurants; the red Ford Explorer SUV and it's gadgets; the extra car we borrowed from son Greg (thanks, Greg! ), a Ford 350, 4-door, diesel (only Tom drives this) and the excellent quality clothing we've been able to purchase at reasonable prices sans sales tax. (The donations pile for Goodwill is growing). The only negatives are the traffic, the crowds and the waiting in line. But, we can console ourselves with the fact that the trade-offs are certainly worth it...being together with those we love. It doesn't hurt to know that the backed-up traffic and crowds won't be a permanent challenge for us when in 50 days we'll be in a relatively quiet and somewhat remote area in Costa Rica with wonderful memories to sustain us. 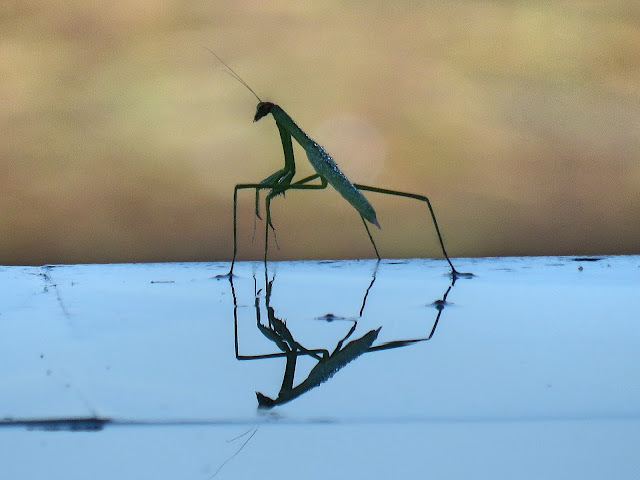 Praying Mantis on the edge of the infinity pool in Bali. with his/her reflection in the water. For more photos, please click here.